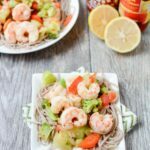 Ready in just 15 minutes, this recipe for Sweet & Spicy Shrimp with Soba Noodles is easy to customize and perfect for busy nights. Add garlic and vegetables to a large pan and saute over medium heat for 5-10 minutes or until desired texture is reached. Add remaining ingredients to pan and cook another 5 minutes or until shrimp are cooked through. Add noodles to pan, toss and serve!